Man, oh man! If there ever was a sweet dessert, this would be it. 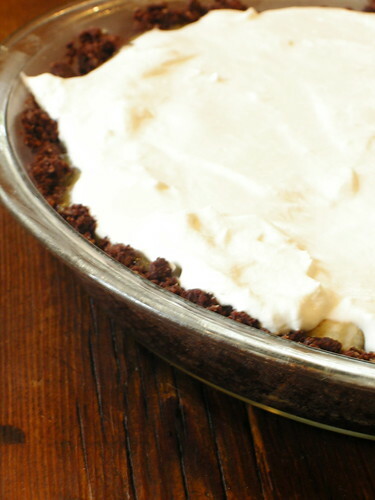 For those of you who find yourselves flocking to the dessert table at potlucks and parties, those who love the holiday season because of the treats, and those who think a chocolate milkshake is a normal breakfast, this is the perfect pie for you. The combination of very ripe bananas, butterscotch, and sweetened whipped cream coupled with a sugary cookie crumb crust was overwhelming for me, but I definitely could see the appeal. Don't get me wrong. 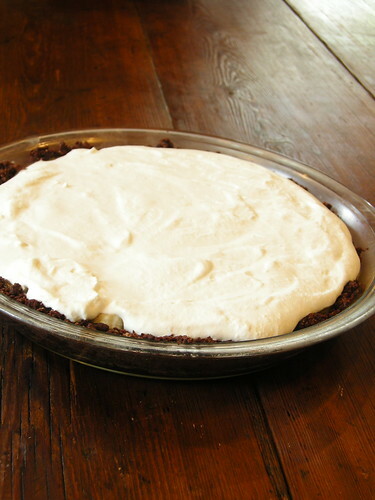 Each of the elements on their own are quite scrumptious, and the liqueur in the butterscotch custard and whipped cream does dress it up a bit, but I, the Queen of Desserts, could not handle this pie. Even though I didn't particularly care for this recipe, I do have to admit that it was a lovely looking thing. It made me wish I wanted to eat it. Sometimes you really shouldn't judge a book by its cover. Combine chocolate cookie crumbs with sugar and melted butter. Butter a 10-inch pie pan. Using your palm and heel of your hand, press cookie crumb mixture evenly on the bottom and sides of the pan up to the rim. Chill crumb crust in refrigerator or freezer for 30 minutes. Preheat oven to 350. Bake cookie crust for 10 minutes. Set aside to cool completely before filling. Heat dark brown sugar and butter in a saucepan until butter has melted and thoroughly combined with sugar. Transfer butterscotch into a large bowl. Whisk cornstarch with a small amount of milk until smooth. Pour rest of milk into a heavy saucepan and add salt and slurry of cornstarch. Cook over medium heat, stirring constantly until the mixture thickens and begins to boil. Whisk small amount of hot milk mixture into egg yolks and then scrape the warmed egg yolk mixture into the saucepan. Keep cooking and stirring custard until it comes to a boil again. Remove from heat and strain into butterscotch. Add rum and vanilla and whisk until butterscotch has dissolved into custard. Slice bananas into 1/2-inch thick slices and scatter over bottom of the baked cookie crust. Pour custard over, cover with plastic wrap, and refrigerate until chilled. Whip cream until it just begins to mound up softly. Add sugar, rum, and vanilla extract, and keep whisking until the cream holds soft peaks. Spread over pie. I wish I could have tasted this beauty!